Insieme Ristorante is located within the business district of Adelaide on Flinders Street. Popular among white collar professionals, Insieme is the place to go for an authentic Italian fine dining experience. The two owners, Caroline Swaffield and Raffaela Del Vecchio, have a wealth of hospitality experience behind them and invite customers to the “insieme” experience. The word “insieme” means “together”, and in true Italian tradition, reflects how the dining experience is to be shared. The menu is rustic Italian and doesn’t go overboard on the offerings, instead, there is a focus on quality and fresh, locally sourced ingredients. 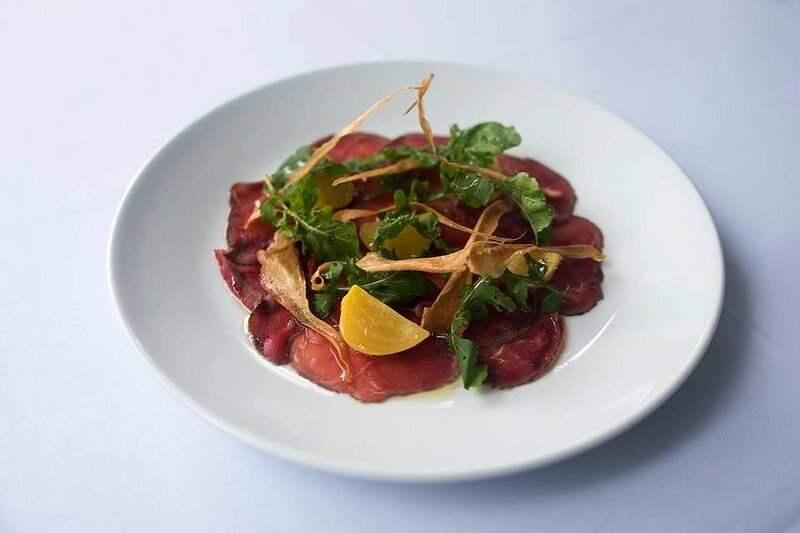 We start with the Venison Carpaccio which is marinated in thyme and garlic and topped with rosemary, beetroot, parsnip chips and arugula. The thin slices of venison have a silky, smooth texture and is complemented by the sweetness of the beetroot and the crispiness of the parsnip chips and arugula. Next was the Risotto Barbabietola; a risotto with golden beetroot, goats cheese and arugula. 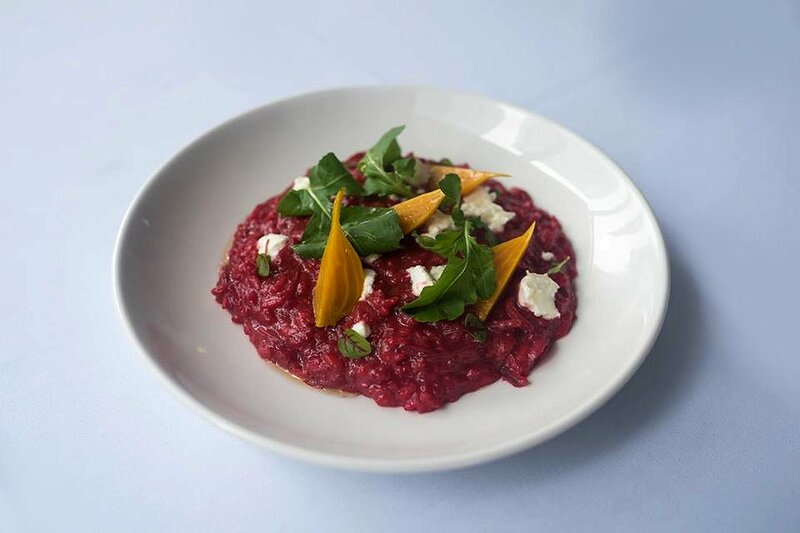 The risotto had a lovely purple colour, like that of beetroot, but without the sweetness. The risotto was rich without being too heavy, and the rice was perfectly cooked. The sweetness of the golden beetroot was balanced by the saltiness of the creamy goats cheese. The arugula created a contrast in texture by adding more crispness to the dish. 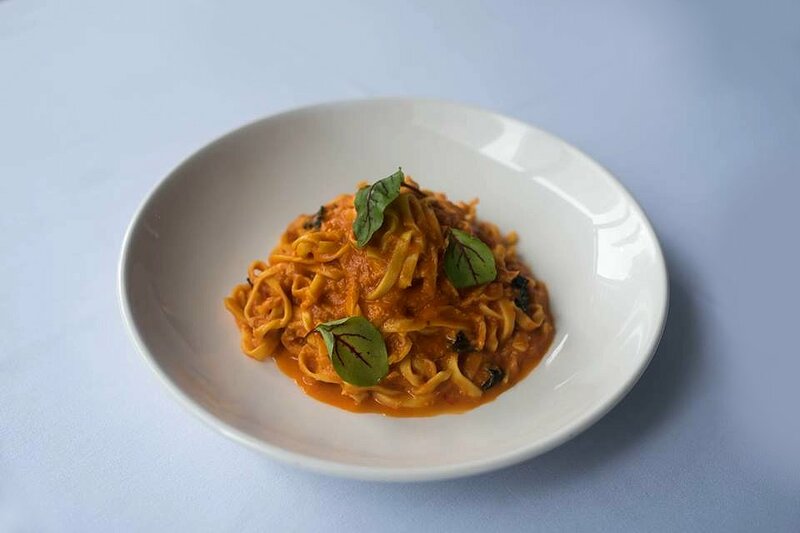 We are huge fans of crab meat pasta so we couldn’t look past the Tagliarini Granchio, a fine ribbon pasta with blue swimmer crab meat, chilli, basil and rose sauce. The pasta is made fresh in house and was cooked to perfection. The dish was full of sweet blue swimmer crab meat and fortunately, I didn’t come across a single crab shell. The pasta was smothered in a red, rich rose sauce, with slices of fresh chilli adding excitement to the dish. Another favourite was the Pesce del Giorno (Atlantic Salmon). 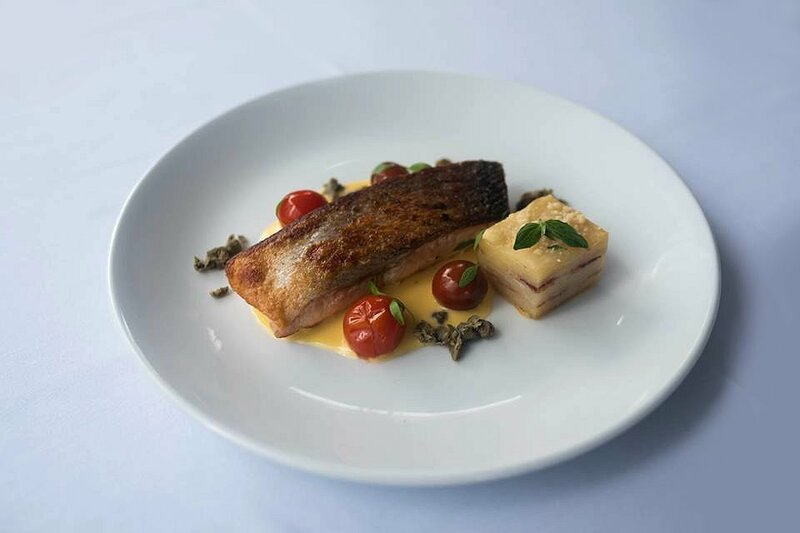 A dish with crispy skinned salmon, potato pave, blistered heirloom tomatoes, capers and limoncello emulsion. The salmon was perfectly cooked with its cloudy, pink colour. The fish was juicy and succulent, and the skin was nice and crispy. The other elements of the dish created a good contrast in flavours; the sweetness of the tomatoes, the saltiness of the capers and the tartness of the emulsion. As we always say, there’s always room for dessert, so much room that we decided to have two. First was the Poached Pears with shortbread and mascarpone cream. 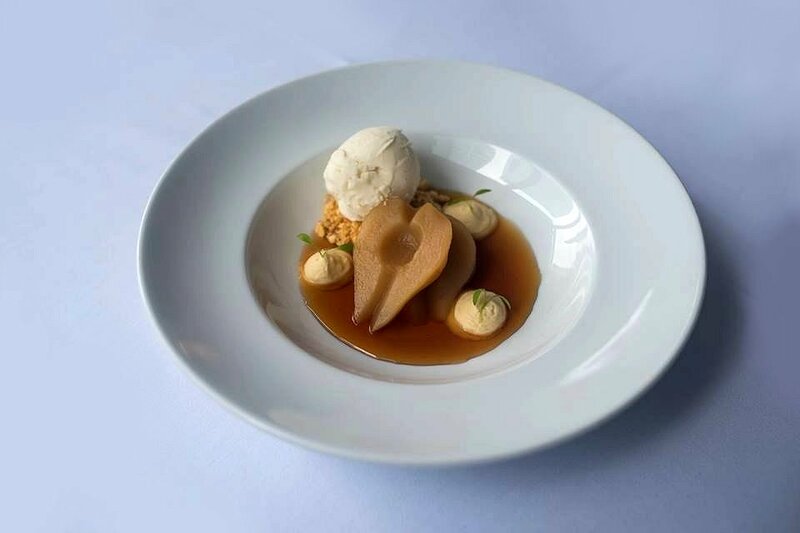 The pears were soft and firm, and soaked in a spiced dessert wine syrup. The taste of alcohol was present and the syrup wasn’t overly sweet. The shortbread soil added a nice crumbly texture, and the dessert was further complemented by the smooth and creamy vanilla ice cream. The Chocolate Cake was beautifully presented with raspberry jelly, honeycomb and vanilla ice cream. The cake was firm and spongy, and full of chocolatey goodness. 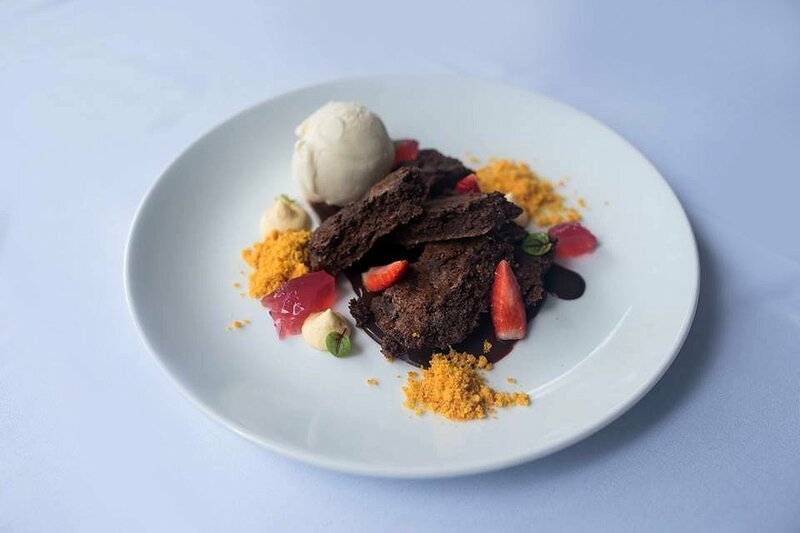 Combined with the sweetness of the jelly, honeycomb, ice cream and chocolate sauce, this dessert will please those with a sweet tooth. At Insieme it’s not just about great food, it’s about the whole dining experience. The customer service is exceptional with the staff being accommodating and attentive, and not overbearing. The atmosphere is so relaxing, it’s so easy to spend a few hours at the restaurant without even knowing it. These are some of the reasons why Insieme has so many repeat customers. Insieme Ristorante is open from 9am-4pm on Monday and Tuesday with lunch starting at 12pm, and from 9am till late from Wednesday to Friday with lunch starting at 12pm and dinner at 6pm. Next Post Sukhumvit Soi 38 x Chaffey Bros.